Experience Food, Tango, Soccer, and Eco Tourism in One of the Most Passionate Countries in South America! Filled with marvelous sights, cuisine, and people, it’s no surprise that Argentina is one of the most desirable places to teach English abroad. With so much to do, see, taste, and experience, it’s no wonder that expats find it difficult to leave once they’ve arrived. A steady economy and the high demand for speaking English among native people create a great environment for teachers wishing to work abroad. As is the case with any large country, some less-than-favorable working situations do give great schools a tarnished name. You will not become monetarily wealthy by teaching English in Argentina, but what you lack in salary will undoubtedly be made up for in once-in-a-lifetime experiences. How many Westerners can say that they’ve lived in a country where fútbol is religion? Because of the popularity of teaching English in Argentina, holding a TESOL or TEFL certificate is almost essential. Not all employers will require one, but it will certainly increase your odds in the competitive market here. Because of the popularity of working here, Buenos Aires is home to a multitude of schools that offer such programs, so you can actually earn your certification while living in the country. However, it will cost a pretty penny. A college degree and prior experience will also move you up in the race to secure a job. Teaching in an elite private or international school will also require applicants to hold an actual teaching qualification from your home country, so be sure to do your research before getting your heart set on a certain job. As is the case with all of Latin America, obtaining a visa entirely depends on you. Recruiters will be able to assist you if you want to go the legal route, but you are ultimately responsible for your visa. This can be done from your home country, but expect a somewhat lengthy process. If you are eager to get your feet on the ground in Argentina before obtaining a visa, you have a couple of options, too. Citizens from the USA, UK, Canada, and Australia can enter the country on a 90 day tourist visa and are legally allowed to work during this period. You can start here and try to figure it out from there, or try to find your own work. Longer stays do require a work permit, and most legit companies will have someone work as a representative for you in the legal process. From within the country, this process should only take about a month; outside, it will take much longer, making this a preferred route of entry for a lot of teachers. Argentina’s massive population and high literacy rate create an environment filled with opportunities for English teachers, and it is actually one of the better Latin American countries for finding posted jobs through recruitment agencies. However, interviewing in person is still the preferred method of contact and will prove most lucrative for prospective teachers. Buenos Aires, the capital, is a cosmopolitan city with over 30 language centers, so the number of job availability is promising. Smaller cities are not exempt from the reaches of English, so rural-seekers shouldn’t be dismayed. Many schools also require students to learn English, which only furthers your chances. Licensed teachers looking to be compensated for their education can search in the international school sector, as well, but these are mostly located in the capital. Peak hiring seasons for public and private schools occur from February to March and July to August. However, language institutes can be in need of teachers throughout the year. Live-in tutoring is also an option provided by wealthier families keen to get their children ahead in the game. This also presents a unique opportunity to totally immerse yourself in Argentine culture. Teachers will be compensated to a degree that allows them to live comfortably after working 25 hours per week. This typically ranges from $10 to $15 per hour. However, this may only be true with well-established schools and institutes and does not cover the sometimes extensive transportation costs that exist if you live in the big city. Argentina is not immune to cons and shams, so try to adequately suss out the situation when you take on a contract or even private lessons. When in doubt, the legal, contractual route usually fares best. 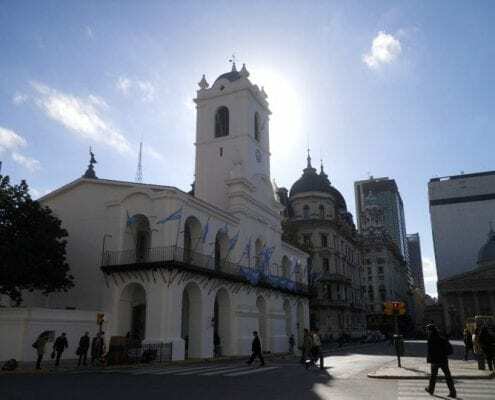 The capital of Buenos Aires is an enchanting city, for sure, but failing to venture outside it would be doing this great country a major injustice. It is so vastly diverse and has a seemingly infinite number of offerings so that anyone, no matter what you’re into, will be able to have countless, full-on cultural, culinary, and scenic encounters. The first and most obvious reminder of Argentina’s beauty can be found at the mighty Iguazú Falls. A UNESCO World Heritage site since 1984, the falls are one of the stars of Argentine natural attractions. A set of well-maintained catwalks allows visitors to view over 275 waterfalls and cascades safely and without visual hindrance: you stand right over the edge! It’s seriously a wonder to me how this place isn’t considered one of the Seven Natural Wonders of the World. Of course, an Argentine experience wouldn’t be complete without a trip to Patagonia. With tons of glaciers that make-up the world’s third largest store of fresh water and sites that can’t be matched anywhere else in the world, there is literally an infinite number of possibilities. The avid outdoorsy can hike, camp, whale watch, and make the region their oyster while people who are less inclined to the strenuousness can certainly go on various boat tours. Truthfully, if you can’t make it to this mecca of natural beauty, the massive landmass that is Argentina has plenty of other, more “day-trip friendly” options that are sure to not disappoint. The list of outdoor wonders in Argentina is too numerous to name each individual place, so you’ll have to do some searching yourself. However, one thing for grape-lovers to not skip out on is a good ol’ fashioned wine tour- Argentina is a global front-runner in the production of red wine, after all. The Mendoza region is a particularly good choice for a tasting tour, as its dry, sunny climate is near perfect for the cultivation process of Argentina’s famous Malbec wine. You can book a bus tour that will take you to multiple vineyards or, if you’re up for a more individually-tailored experience, you have the option to hire a knowledgeable private driver who will create a uniquely personalized tour for your party based on your taste preferences. Either way, it’s a win-win for you on the taste front.